All these pictures and icons of everyone becoming Simpsonized lately reminded me of something... it took me hours of digging through old notebooks and pictures, but I found it. 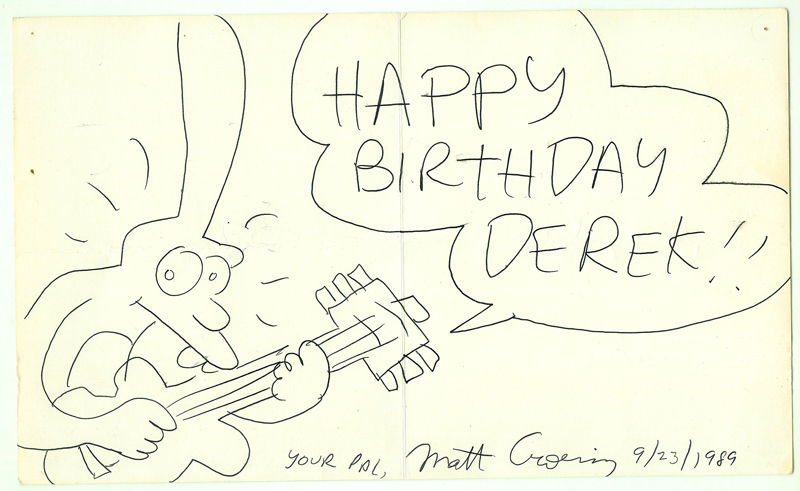 A drawing that Matt Groening himself drew for me, by hand, back in 1989, just months before the first Simpsons episode aired. So not even Simpsonized, but Binky-ized. Binky has a guitar in his hand because that was my schtick back then. When my brother asked Groening (who came into the bookstore my brother was working at) to do the card for me, he asked him what I did and he said play guitar. Anyway, not to be, like, all in your face about it, but to all those that got their computerized Burger King caricatures, put this in your pipe and smoke it.